LAHORE: (Tuesday, May 02, 2017): Punjab University Vice Chancellor Prof Dr Zaffar Mueen Nasir has said that historians must write history without any prejudice and rewrite what happened in the past to unearth facts. 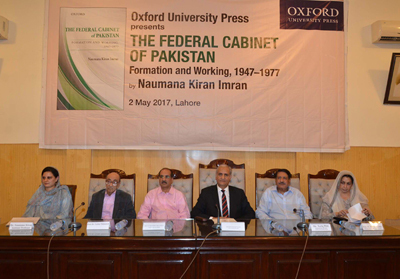 He was addressing the book launching ceremony of Dr Naumana Kiran on “The Federal Cabinet of Pakistan Formation and Working, 1947-1977” published by Oxford University Press at Al-Raazi Hall on Tuesday. Dean Facutly of Arts and Humanities Prof Dr Iqbal Chawla, Dr Massarrat Abid, Dr Naumana Kiran, Dr Farhat Mahmood, Tariq Haq, senior faculty members and large number of students were present on the occasion. Addressing the ceremony, Dr Zaffar Mueen Nasir said that most of the historian wrote history with their own perspective. He said that realities were either ignored or distorted. He said that it was unfortunate our history had biases. He congratulated Dr Naumana Kiran on writing first book of its kind and pointing out strengths and weaknesses of the era. 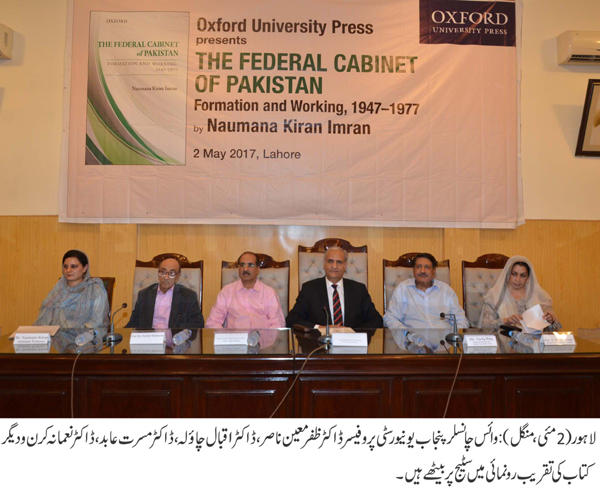 The speakers appreciated Dr Naumana Kiran on providing comprehensive information regarding federal cabinet in that era and congratulated her on achieving this exclusive milestone.